Vince Camuto has launched Solare, a new fragrance for men. A celebration of vitality and creativity, Solare is bold, confident and daring. A woody, oriental fragrance, Solare ignites the senses with sophisticated notes of juicy mandarin and cardamom, blended with sensual musk and cashmere wood. 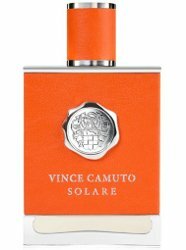 Vince Camuto Solare is available at Macy's, $70 for 100 ml Eau de Toilette. Update: Solare was developed by perfumer Claude Dir. Additional notes include pimento leaves. It will also be sold in a 50 ml size.